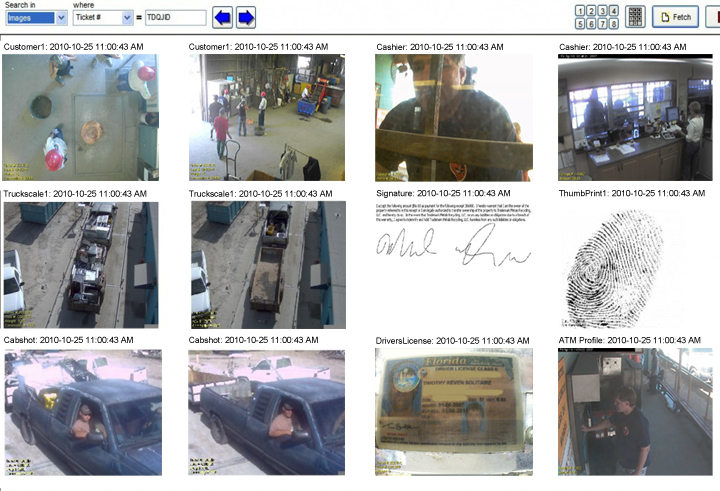 Track Fingerprints, Documents, Signatures, Driver's Licenses, etc. Each time a weight is taken either on a truck or platform scale, the scale program triggers a snapshot from one or group of cameras. The camera trigger action updates JPEGger with the weight, commodity, customer and any other information that is specified. A second group of snapshots are taken when the tare weight is recorded. A scale ticket is printed for the customer who either takes it to an ATM for payment or presents it at the pay window. At the pay window we capture a current image of the customer and an optional fingerprint image or electronic signature. Automobile titles, signed scale tickets and other paperwork can be scanned into JPEGger at this time. If the customer is not on file, the customer’s data is captured from the customer’s Driver’s License using OCR (Optical Character Recognition), magnetic stripe or 2D barcode.